A trio of local creatives threw an intimate (and seriously stunning) tropical-themed dinner party to celebrate the opening of The Vault on King—Charleston’s newest creative co-op. Get their fresh entertainig tips and recipes! 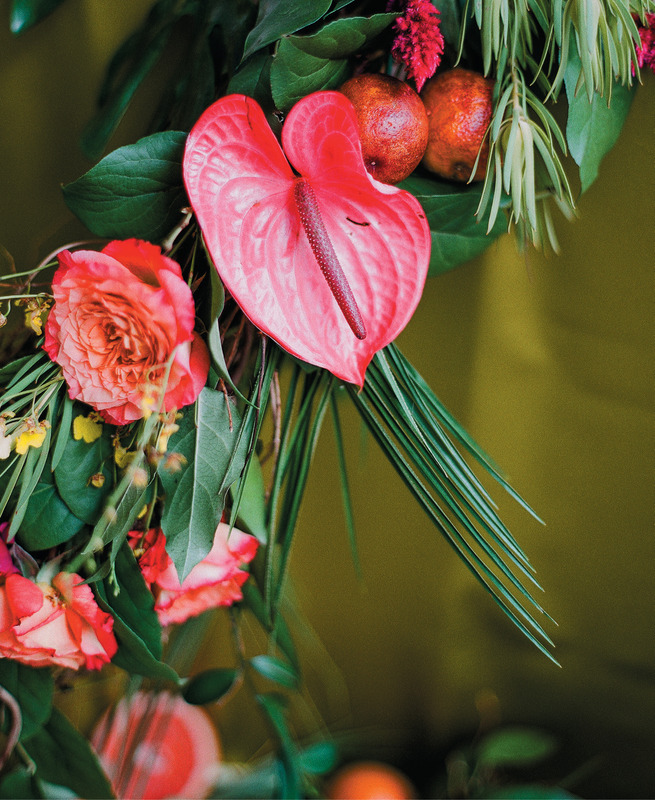 The Vault hostesses Julie Livingston and Reagan Barnes collaborated with floral designer Wimberly Fair on the party’s lush, exotic flora, including anthurium, garden roses, pincushion protea, and orchids amidst Leucadendron, monstera, and palm greenery. 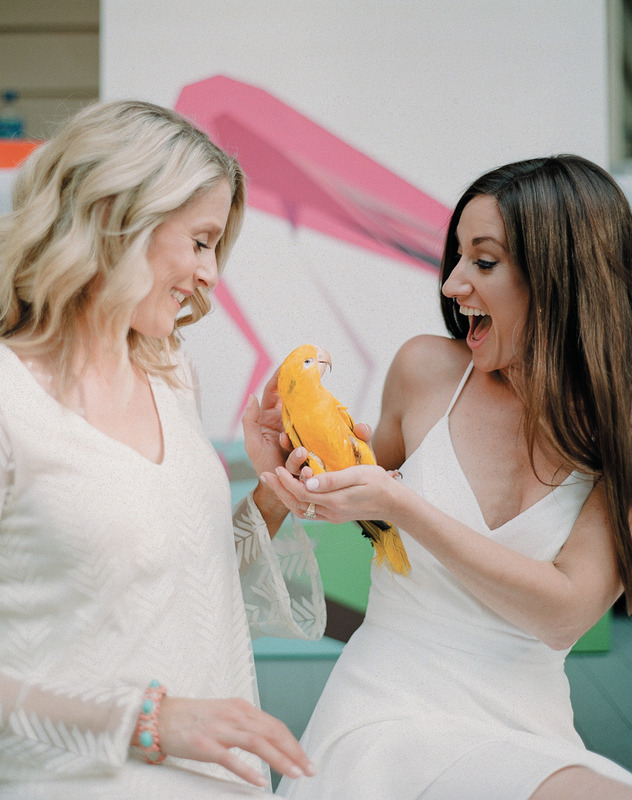 Vault member and photographer Anne Rhett arranged for two tropical birds—Buddy, the blue-throated macaw and Neena the golden conure—to be on-site through their handler Backyard Treasures, which led to many a laugh and photo op. Each place setting of classic white and gold china chargers and dinner plates was topped with a uniquely patterned salad plate, as well as hand-painted acrylic menu cards by Mary Ruth Miller. Guests were asked to wear all white with colorful accessories; check out Tenny Morrison’s fun ensemble. 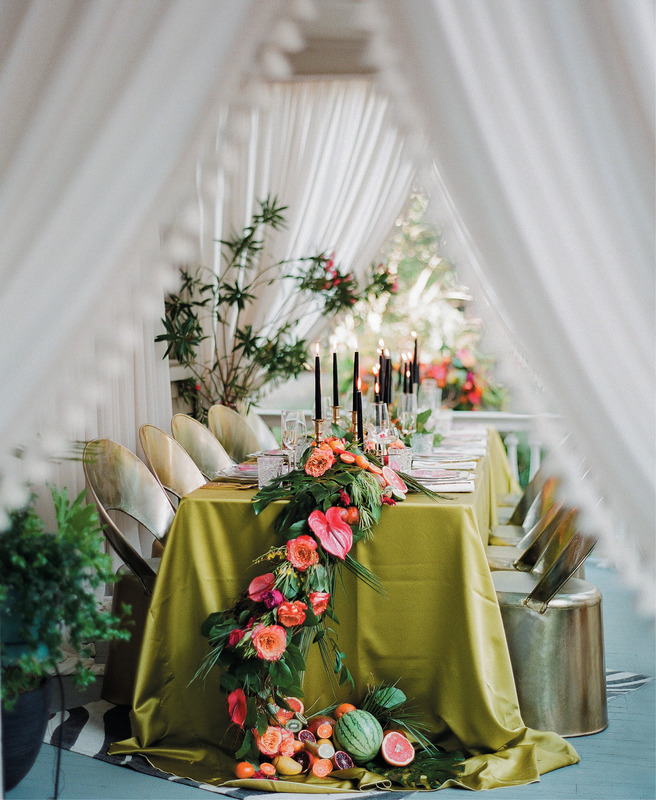 Wimberly Fair created the wow-factor floral and fruit arbor surrounding the punch table. ...to the simply perfect lime place-card holders. With talent in the family, Julie didn’t have to rely on a digital playlist. Her musician brother, Chad Livingston, played an acoustic set during dinner. Reagan suggests situating any live entertainment about seven to 10 feet from the table so the sound doesn’t overwhelm conversation. In addition to the fabric draped around the piazza, The Social Spool added a panel along the wall, creating a clean backdrop. “We knew that the table would have a lot of dynamic interest so we needed to simplify the surroundings,” says Reagan. Situated on the same block of King as franchise giants H&M, Lululemon, and Madewell, a new creative co-op overflows with local talent. What was once a drab bank building is now The Vault on King, the professional home and showroom for a flock of female entrepreneurs including four painters, three fine-art photographers, two interior designers, one luxury event planner, and one fashion designer. Originality abounds in the space, from artist Whitney Stoddard’s sultry silhouettes to designer and photographer Teeny Morrison’s one-of-a-kind home treasures. So when two members of the group—fine art photographer and home goods curator Julie Livingston and event planner Reagan Barnes—decided to plan a party to celebrate the co-op’s launch, they knew it had to be fabulous, fun, and amazingly fresh. 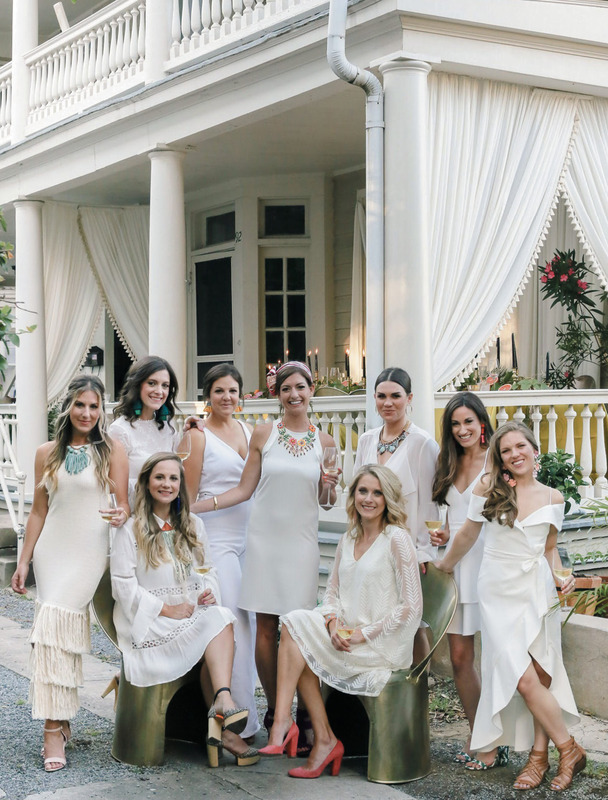 To help host, the pair enlisted fashion, entertaining, and lifestyle blogger Kristin Chambless of Colors by K.
The trio dreamt up an intimate, tropical-themed supper held on the piazza of Julie’s historical home, but kept the vibe of the evening a surprise to partygoers, only telling them when and where to show up and requesting they each wear all white. The result? A wildly chic, modern, and oh-so cohesive Havana-themed fête that blew the ladies of The Vault away. Read on to find tips for throwing your own memorable dinner party, whether you’re celebrating a special occasion or just want to host an evening your friends won’t soon forget. (Left) Each place setting of classic white and gold china chargers and dinner plates was topped with a uniquely patterned salad plate, as well as hand-painted acrylic menu cards by Mary Ruth Miller. (Right) Wimberly Fair created the wow-factor floral and fruit arbor surrounding the punch table. Guests were asked to wear all white with colorful accessories; check out Tenny Morrison’s fun ensemble (bottom left). 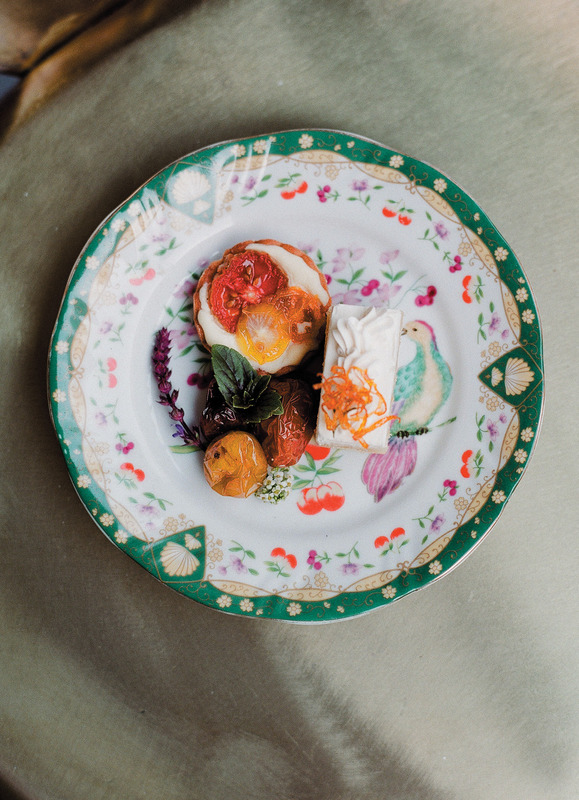 Similarly, each place setting of classic white and gold china chargers and dinner plates was topped with a uniquely patterned salad plate, as well as hand-painted acrylic menu cards by Mary Ruth Miller. 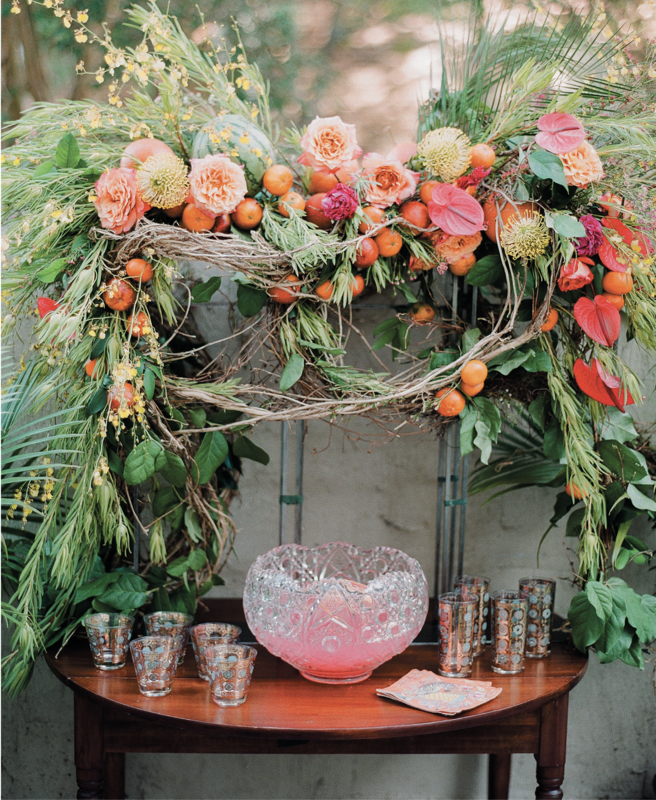 (Opposite) Wimberly Fair created the wow-factor floral and fruit arbor surrounding the punch table. ■ Work the color wheel. Kristin suggests letting something as simple as a palette of colors guide you. 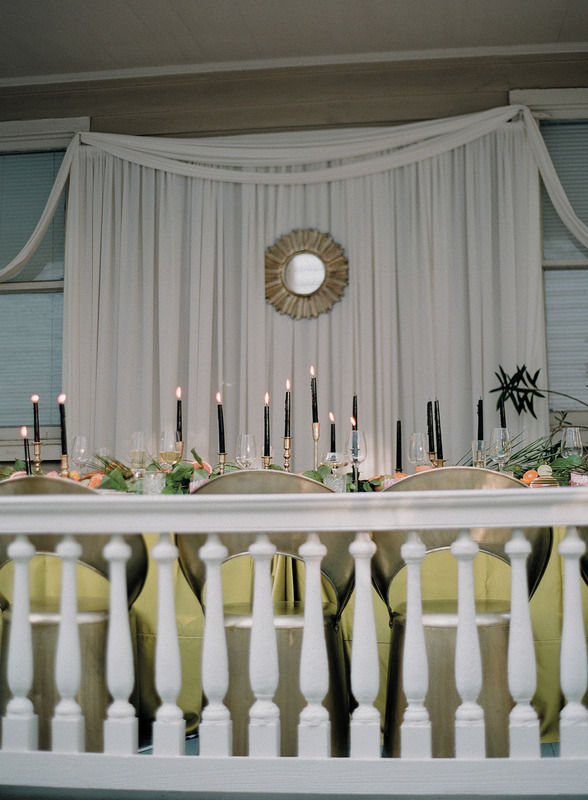 “That chartreuse linen was everything,” she says, adding that the rest of the tablescape was designed around it. ■ Take a cue from fashion. It can take a few seasons—years even—for fashion trends to make their way into home décor, notes Kristin. To ensure her party designs are fresh, she keeps an eye on the runway and pulls ideas accordingly. Hot this year? Tassels, which The Social Spool added to the drapery just for this event, and chartreuse. ■ Utilize rentals. 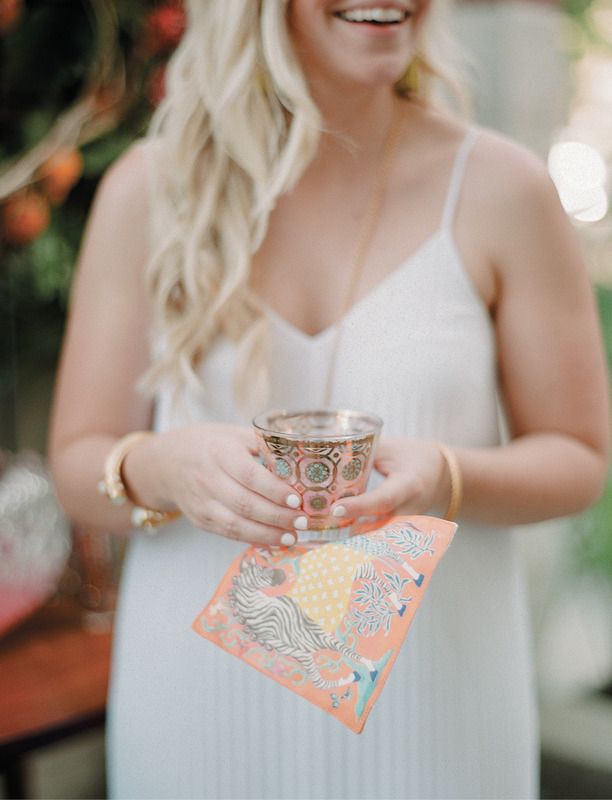 China and glassware are key for driving home a motif. If you’re on a budget, consider renting just salad plates, which Kristin says will give you the most bang for your buck. ■ Let guests in on the fun. 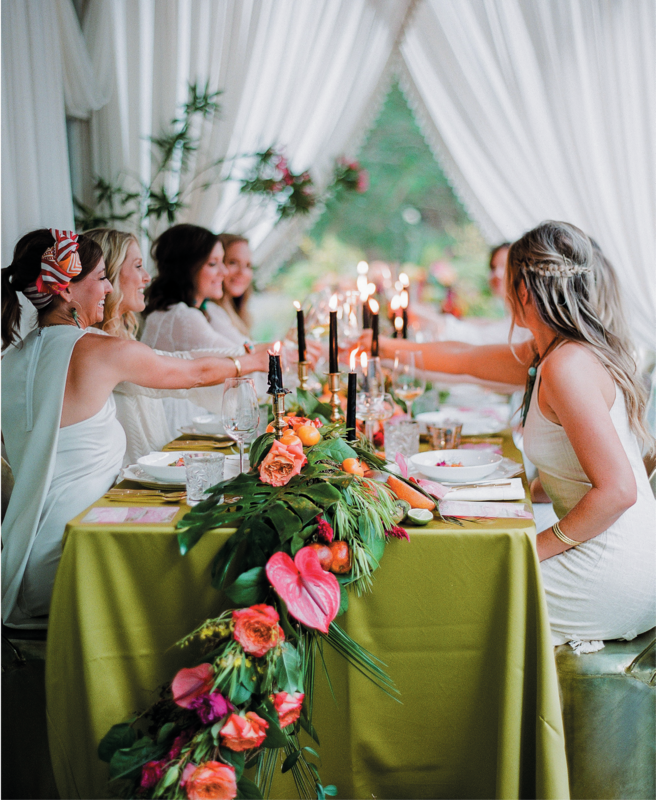 Since the tablescape was so bold, the party planners asked attendees to wear white and only accessorize with fun hues. 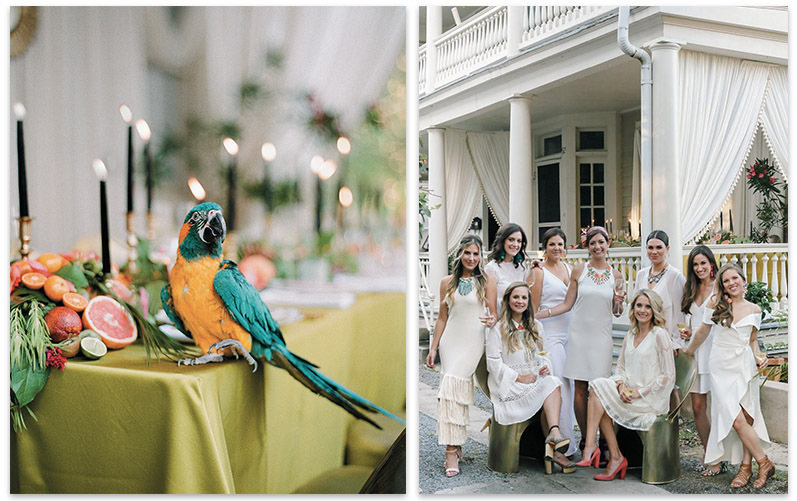 A color-coordinated group of guests makes any fête more cohesive (and Instagrammable). Kristin recommends trying white or black, as most people have plenty of each at the ready. 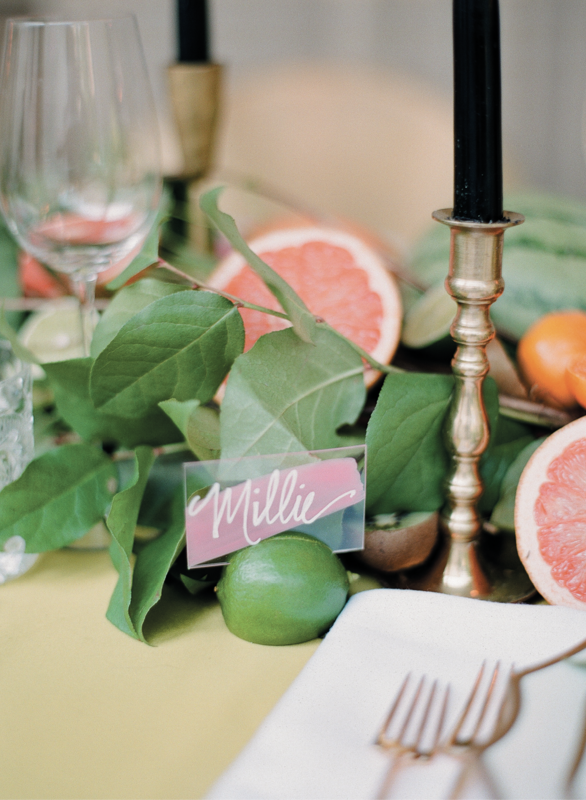 Citrus and tropical edibles appeared everywhere from Cru Catering’s grapefruit and elderflower punch (left) and the simply perfect lime place-card holders (right). 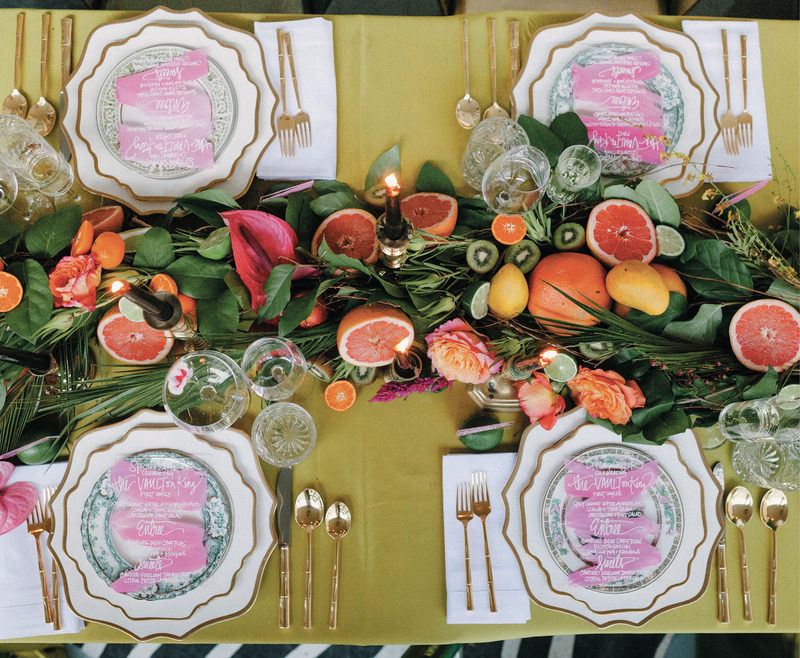 “Incorporating fruit into a tropical-inspired party only seemed natural,” says Reagan of the abundance of citrus, melons, and exotic edibles blended into the décor. 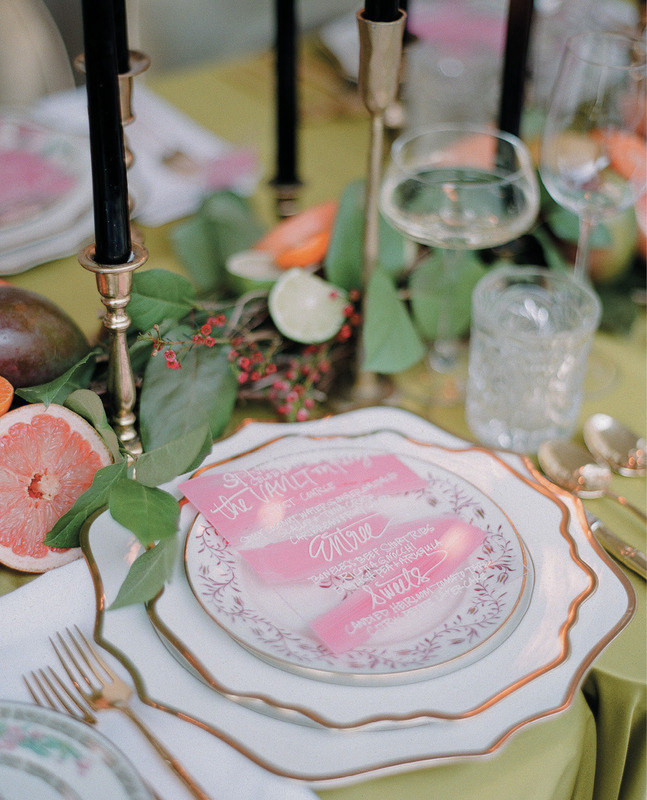 The ladies crafted cornucopias at either end of the table (which helped anchor the runner both visually and physically); on the tabletop they layered whole and halved fruits amidst a bed of greens, orchids, and other tropical flora provided by Wimberly Fair. 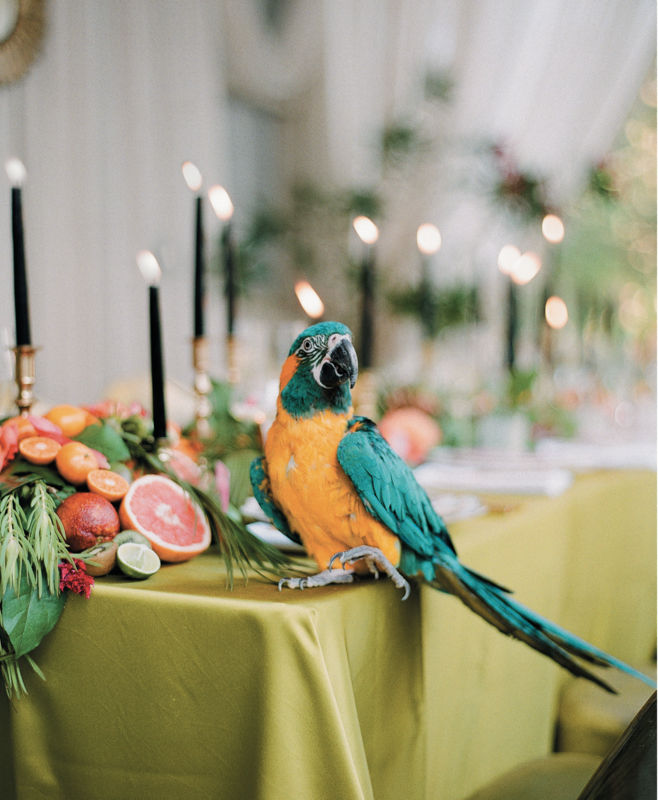 “We loved the vibrancy of each fruit, inside and out, and felt that it was a small but impactful way to add punches of color to the tabletop,” Reagan notes. Additional perks? It smells amazing, it can be repurposed (Julie whipped up smoothies for days afterward), and it’s less intimidating to DIY than floral arrangements. “It can easily be replicated at home for any occasion, and you don’t need a florist to source it,” says Reagan. ■ Time it right. Reagan recommends arranging fruit ahead of time, but waiting until the last minute to slice it. ■ Give ’em a squeeze. Though Kristin says they had no trouble with fruits running, she recommends lightly squeezing juicier fruits to stop excess liquid from soiling your linens. 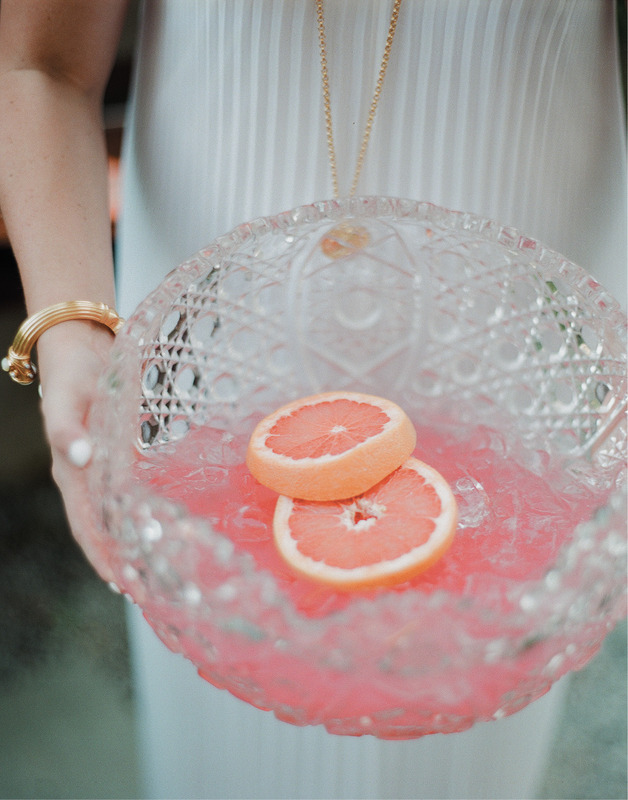 ■ Skip lemons and blood oranges. The former tend to be overdone, explains Reagan, and the latter—though beautiful—can be messy. “We found them to be too juicy!” says Kristin. ■ Keep some whole. While some fruits look beautiful sliced (like grapefruit, kiwis, limes, and oranges), others, such as pitted mangoes and seed-filled watermelon, are best left intact, say the ladies. ■ Work it into the menu. 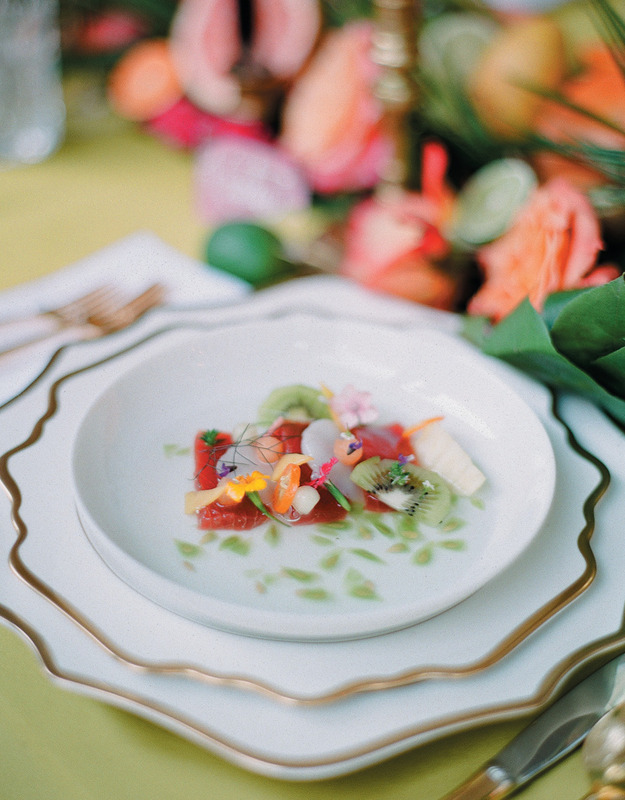 Cru Catering played up the tropical theme by creating a menu full of seafood and fresh fruit. Julie had been looking for an occasion to host an alfresco party, and this fête proved the perfect opportunity. “We wanted to utilize a Charleston porch but show that you can transform it into something else,” says Julie. “It felt like we were in a beach cabana.” The Social Spool hung fabric around the perimeter of the piazza, affording privacy from passersby, upping the cozy vibe, and offering a host of other practical perks: Drapes ensured no diners stared straight into the sun during dinner and helped ward off bugs. An added bonus for the host? Julie has kept the stylish swag up since the party. “I literally see people stopping to take pictures of my porch,” she laughs. ■ Create a schedule. Properly managing your time leading up to the event lets you enjoy yourself while it’s happening, says Julie. Clean the space days ahead and do as much party prep as possible the day before. ■ Consider a caterer. Unless cooking is a major passion, Kristin recommends enlisting a caterer or private chef for dinner parties with more than six guests. “I think people would be surprised at how affordable it can be,” she says. ■ Assign seats. Seat assignments both relieve the pressure of picking a place to sit and encourage lively conversation. 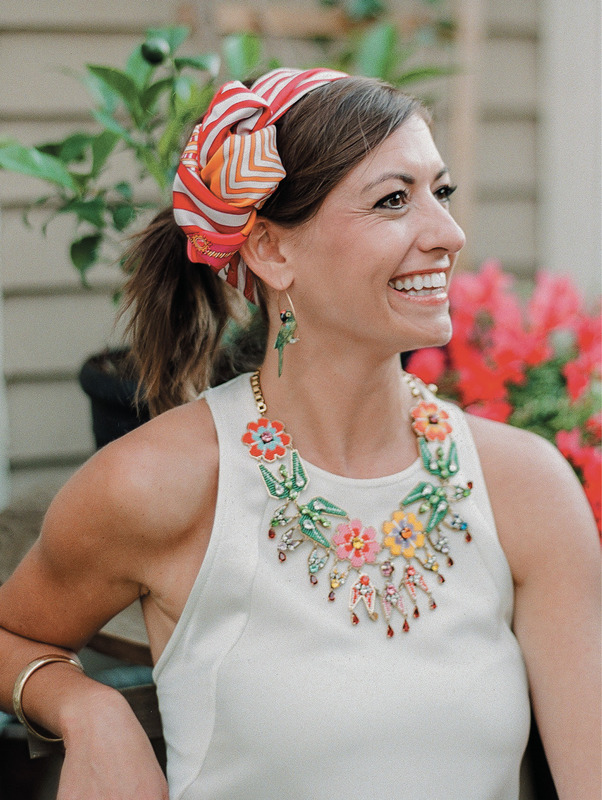 “I’m mindful of the industries my guests are in and consider what they may have in common,” says Kristin. Also consider their personalities: If you have an especially shy friend, be sure to seat him or her next to a familiar face. ■ Up the entertainment. 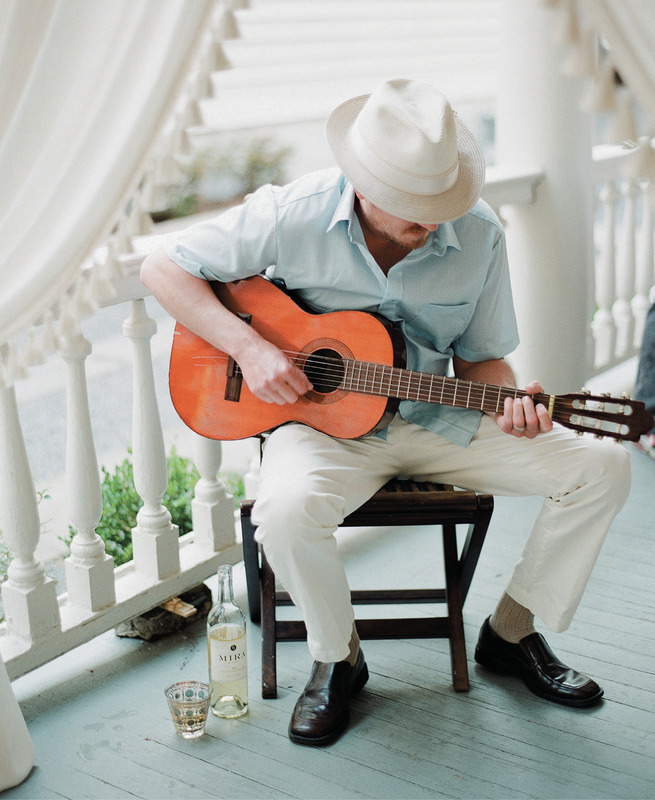 Background music—whether live or a playlist—fills awkward silences and reinforces the theme. ■ Buy to-go boxes. Want to avoid eating leftovers for days? Stock up on paper to-go boxes to make doggie bags for guests. Or, in the case of the dessert table, set out pretty packaging and invite attendees to pick and choose their own goodies, recommends Reagan. ■ China, silverware, punch bowl, & glasses: Polished!